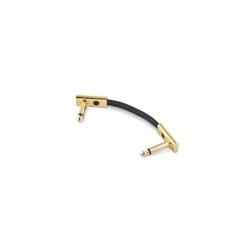 ReMix AV Solutions - 7816 Rockboard Flat Patch Cable Gold 1 15/16"
/ Live Sound / Cables, Snakes, and Goosenecks / 7816 Rockboard Flat Patch Cable Gold 1 15/16"
The Rock BoardGold Series Flat Patch Cables lift our popular Flat Patch Cables onto a new level of quality. Designed to be extra flat and space-saving, they optimize pedalboard real-estate, featuring a slim rectangular body and extra thin angled plugs. Their contacts and plug housings are gold-plated. The Cables feature a double shielding of braided copper wire and aluminum foil that shields the flexible copper conductor core from high as well as low frequency interference. The Gold Series Flat Patch Cables guarantee best signal quality and keep your setup tidy and neat looking.